In June of 1999, earthquakes rumbled near the Pacific Northwest coast  not on land, but in the sea. It was not an unusual event. Along Earths mid-ocean ridges, which stretch around the planet along the ocean floor, tectonic activity is normal. But when these quakes struck, technology made it possible for scientists to watch what happened. Tectonic activity generated a swarm of earthquakes off the axis of the Endeavour Segment of the Juan de Fuca Ridge, a portion of the mid-ocean ridge that stretches along the ocean floor near the Washington coast. While the earthquakes went unnoticed by people on land, they did affect a different type of community: the ocean-bottom life forms thriving near hydrothermal vents along the ridge axis. These vents are openings from which fluids heated from Earths mantle enter the seawater, affecting ocean chemistry and supporting life in this seafloor environment. H. Paul Johnson et al., reporting in the Sept. 14, 2000, Nature, and Johnson with Robert Dziak, reporting in the May 24, 2002, Science, published observations showing that 4 to 11 days after the June 1999 earthquake swarm, several vent sites 15 kilometers away and on the axis had increased flow rates and temperature elevations of 2 to 12 degrees Celsius. Pore fluid pressures increased instantaneously at drill holes 25 to 100 kilometers away. After an eight-hour delay, temperatures and flow rates of fluids at vents 220 kilometers away increased. These reactions are delayed compared to the way a terrestrial aquifer would respond. The impact of submarine earthquakes on oceanic hydrothermal systems is not well understood and appears to be quite different from that on land. Observations also showed that the earthquakes fueled an increase in biological activity, including the formation of large bacterial mats and abundant suspended bacterial floc. Microbial communities are particularly sensitive to changes in temperature; a few degrees difference can change the dominant microbe species present. Thus every earthquake or earthquake swarm has the potential to significantly change the subsurface biosphere. These observations show that seismicity significantly affects the environment along the crests of mid-ocean ridges. This environment supports the biospheres on and beneath the seafloor. The hydrothermal response to seismicity is complex, and the impact is greater than what is expected given the amount of seismic energy released. The processes that link crustal strain, earthquakes and hydrothermal circulation through the ocean floor are the subjects of active research. These observations also demonstrate a direct relationship between geology and biology along the planets mid-ocean ridge system. Understanding this system requires research that combines traditional disciplines. Much of the ridge science going on today is funded through Ridge 2000, a National Science Foundation program that views spreading ridges as whole systems and recognizes that the processes supporting the biospheres on and beneath the deep ocean floor are interlinked with the geological processes driving the systems. Earths mid-ocean ridges stretch around the planet. Tectonically and volcanically active, they are the places where new crust forms. The mid-ocean ridge system hosts one of the most complex and hostile environments on our planet. Life here exists without sunlight and is supported by vented hydrothermal fluids driven by heat from magma chambers. Understanding the processes that occur on the ridges requires the diverse expertise of physical and life scientists. Seafloor spreading and life on ridge axes are a challenge to understand not only because of their remote locations, but also because they operate as a complex interaction of geological, geochemical and biological processes. Since the exciting discoveries of these volcanically driven hydrothermal vent systems in the mid 1970s, this underwater world has been actively researched. By the mid-1980s, scientists recognized the need for long-term observations to answer larger questions of whole system processes and interactions. As a result, ridge-crest investigations were formally included as a major initiative of the long-range plan of NSF, and a large-scale program began: RIDGE, the Ridge Inter-Disciplinary Global Experiments. In its 12-year tenure, the RIDGE program initiated more than 215 investigations, many involving four or more principal investigators from a wide range of disciplines, to unlock the mysteries of this deep-ocean cradle of planetary renewal. The idea of an interdisciplinary program to study ridges and associated hydrothermal systems began in 1987 at a workshop convened by the National Academy of Sciences at the Salishan Lodge in Oregon. More than 80 scientists from the United States and abroad attended to discuss our understanding of oceanic lithosphere evolution, and to identify primary objectives for ridge-crest science for the next decade. Participants agreed that the global spreading-center network operated as a single, dynamic system, one through which energy flows from Earths interior to the lithosphere, hydrosphere and biosphere. They concluded that major strides in understanding this system would demand an interdisciplinary approach to research. The Salishan meeting also, for the first time, provided the opportunity for broad community input into the planning process for such a large scientific initiative. 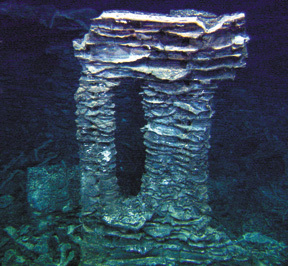 1) No vent megafaunal organisms were present when vigorous hydrothermal activity began in April 1991. Profuse microbial material (floc) was expelled from a fissure within 15 meters of the subsequent location of Biomarker #9. 2) In March 1992, the fissure was colonized by an extensive population of Tevnia jerichonana with Riftia pachyptila noticeably absent. 3) By December 1993, numerous R. pachyptila had settled and formed a dense thicket, engulfing the existing T. jerichonana. 4) In October 1994, the density, lateral extent, and height of the R. pachyptila aggregation had dramatically increased. 5) In November 1995, the density and lateral extent of the R. pachyptila aggregation had increased again and the rust-colored staining of worm tubes was coincident with increased concentrations of iron in the diffuse vent fluids. The arrow in 3, 4 and 5 indicates comparable corresponding location on the seafloor in successive years. By 1989, with financial support from NSF, RIDGE was established to understand the geophysical, geochemical and geobiological causes and consequences of energy transfer within the global rift system through time. From its inception, RIDGE recognized that collaboration among scientists from different disciplines and integration of data from different regions and on different spatial scales were paramount to achieving the ambitious scientific objectives. To facilitate collaborations within this diverse group, RIDGE sponsored (and co-sponsored with international organizations) an average of five meetings or workshops each year, bringing together scientists from all disciplines to share their findings and to plan subsequent experiments and research programs. One of the most successful and innovative approaches for fostering communication and collaboration within the community has been the popular RIDGE Theoretical Institutes (RTI). RTIs bring together field scientists, experimentalists and theoreticians, and provide the required background for researchers and their students to address complex, interdisciplinary problems. The RTI concept has proven an important catalyst for new research as well as an influential force on the direction of the mid-ocean research NSF funds. The first RTI was held in 1990. Called Mantle Flow and Melt Generation beneath Mid-Ocean Ridges, the institute produced an important collection of papers published as an American Geophysical Union monograph. It also inspired the MELT experiment, a large-scale, coordinated field experiment that collected seismic and electromagnetic data to provide observational constraints on mantle flow and melt migration beneath one of the fastest spreading portions of the mid-ocean ridge system. Results of this major effort continue to define fundamental questions of ridge research. Hydrothermal ecology. The 1993 RTI, Physical, Chemical, Biological and Geological Interactions within Seafloor Hydrothermal Systems, was intended to stimulate cross-disciplinary inquiry and focus future investigations toward understanding the hydrothermal systems as whole systems. Researchers were instructed to explain their science and outstanding questions to a non-specialist audience. Scientists from diverse disciplines grappled with elucidating the geological, geochemical and biological processes of ridge systems and then identified potential areas for cross-disciplinary research. One area that proved fruitful was the study of larval dispersal and recruitment of animals to new vents. This work spawned an important, interdisciplinary initiative, the LARVE (Larvae At Ridge Vents) project. Understanding the process of larval dispersal requires understanding the biological processes involved, such as reproductive biology, genetics, larval physiology and recruitment ecology. Researchers also need complementary information on geographic distribution and dynamics of active vent sites, physical transport processes of benthic boundary-layer currents on the spatial scale of vent habitats, buoyancy-driven mesoscale flow features, and segment scale circulation. Geology and biology. The most recent RTI, Subsurface Biosphere at Mid-Ocean Ridges, explored processes associated with the microbial habitats in porous oceanic crust. Physical and chemical processes within young crust are found to provide fundamental controls on the ecology and diversity of microbial communities living there. Likewise, biological processes may play an important role in the chemistry of hydrothermal fluids and crustal aging. This RTI stimulated interactions among marine geologists, geophysicists and microbiologists to identify the key questions, observational techniques and models necessary to further our understanding of the subsurface biosphere. Elucidating the nature as well as the spatial and temporal extent of the subsurface biosphere is now a fundamental goal of the Ridge 2000 program. The Ridge 2000 Program is the new research initiative to understand Earths spreading-ridge systems. Jointly sponsored by the Biological Oceanography and the Marine Geology and Geophysics Programs of the Ocean Sciences Division of NSF, Ridge 2000 builds directly on the scientific and technological successes of the original RIDGE Program. Designed by five multidisciplinary community workshops over the past several years, Ridge 2000 approaches the ridge system as an integrated whole: from its inception in the mantle, to the seafloor biosphere, and to the overlying water column. Located at 9 degrees north latitude on the East Pacific Rise, these hollow lava pillars are common remnants of drained and collapsed sheet flows and lava lakes. They begin as gaps between lava-flow lobes, eventually forming a pipe-like channel between the bottom and top of a lava flow. Water trapped beneath the flow is heated and flows upward through these channels. The cold water promotes the rapid growth of a lava crust around the gaps. Interdisciplinary interactions are built into the Ridge 2000 science plan and the scientific motivation is encapsulated by the phrase, from mantle to microbes. This phrase expresses the inextricable linkages among the processes of planetary renewal in the deep ocean and the origin, evolution and sustenance of life in the absence of sunlight. Ridge 2000 aims for a comprehensive understanding of the relationships among the geological processes of plate spreading and the seafloor and sub-surface ecosystems that these processes support. The program objective of Ridge 2000 is to develop whole-system models through coordinated and interdisciplinary experiments. The program has two research themes: Integrated Studies and Time-Critical Studies. Integrated Studies support multidisciplinary research focused on specific ridge locations. The observations of the diverse effects of the 1999 earthquake swarm on the Endeavour Segment of the Juan de Fuca Ridge described earlier demonstrate the need for this research strategy. Integrated Studies view oceanic spreading centers as whole systems and recognize that the array of processes that support the submarine and seafloor biospheres are interlinked. Organisms living in and beneath the seafloor subsist on the energy and material that is transferred from the mantle through volcanic and hydrothermal systems. The complex linkages between life and planetary processes at spreading ridges can only be fully understood through coordinated studies that span a broad range of disciplines. Requiring researchers to focus their efforts at defined sites should lead to better integration of data and understanding of ridge processes as a whole system. Three sites have been chosen to begin the program: the segment of the East Pacific Rise between 8 and 11 degrees north latitude; the Endeavour Segment of the Juan de Fuca Ridge; and the East Lau Basin Spreading Center in the southern Pacific Ocean. Implementation plans for each of the Integrated Study sites were developed and written this past April at an open community workshop. These plans identify the geographic focus for each site and provide the guidelines for the set of studies necessary at each site. These plans are available for download on the Ridge 2000 Web site. The Time-Critical theme of Ridge 2000 continues the RIDGE focus on observing the immediate consequences of active processes on the seafloor. The mission of this program element is to understand the geobiological impacts of magmatic and tectonic events along the global mid-ocean ridge system. These events are generally transient and include earthquakes that are associated with eruptions, magma migration and faulting from seafloor spreading. Time-Critical Studies are dedicated to facilitating rapid-response missions to observe the consequences of these phenomena  on the seafloor and in the overlying ocean. For example, detecting earthquakes at the bottom of the ocean became possible at the end of the Cold War, when previously classified military technology became available for civilian oceanographic research. In 1993, the National Oceanic and Atmospheric Administration (NOAA) began monitoring SOSUS (Sound Surveillance System), the U.S. Navys cabled hydrophone system in the northeastern Pacific Ocean. Within weeks of the monitoring program, researchers were able to detect earthquakes from a volcanic eruption on the Juan de Fuca Ridge in real-time. The sensitivity and locational accuracy of the SOSUS array were key to detecting this event, which no land-based networks detected. 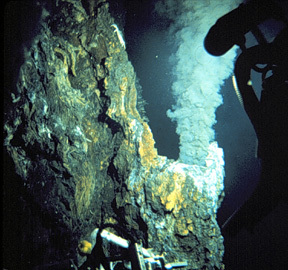 A black smoker vents through a polymetallic sulfide chimney at 20 degrees 50 minutes north latitude and 2,615 meters depth along the East Pacific Rise. Temperatures as high as 403 degrees Celsius have been recorded at the orifice of such edifices, from which mineral-rich fluids emanate. The "smoke" is made of sulfides that precipitate as the hot hydrothermal fluids become oversaturated in sulfur and metals as they mix with cold, ambient seawater. In the following months, five nearby research cruises containing NOAA, Canadian and RIDGE researchers were either diverted or sent to study this area now known as the CoAxial Segment. Using conductivity, temperature and depth (CTD) profiles, as well as multibeam sonar mapping, gravity and magnetic surveys, remotely operated vehicles (ROVs), and the manned submersible Alvin, the scientists explored the area where the acoustic signals were heard. These expeditions discovered new hydrothermal plumes, new high-temperature vent sites, a fresh lava flow 2.5 kilometers long and new venting of bacterial floc to the overlying seawater. The mission was not only a resounding success in the coordination of a rapid response to an event, but it also brought the talents of more than 50 geologists, geophysicists, physicists, chemists and biologists together to study one increment in the seafloor spreading process. Since 1993, four responses have been launched to study seismic events on the Juan de Fuca Ridge and Gorda Ridge, both located in the northeastern Pacific Ocean. The work done here has revolutionized our understanding of active processes and has already provided fundamental new information about the linkages among volcanic events at the seafloor, the development of hydrothermal plumes in the ocean above the ridge crest, hydrothermal circulation and vent biota. Ridge 2000 will continue to monitor SOSUS and rapidly respond to events along the ridge crest. A critical aspect of the success of the Ridge 2000 program (and its predecessor RIDGE) is the open sharing of data. Early in the RIDGE program, researchers saw that they would make significant scientific advances only if data were readily available to everyone in a consistent form. RIDGE-sponsored data sharing began with CD-ROM compilations of seafloor bathymetry. Now these types of data are available on interactive, Web-hosted databases (for example, the Lamont Doherty Earth Observatory global synthesis of high-resolution multibeam bathymetry, and the petrology database, PetDB). These efforts became a basis for new ideas, hypotheses and collaborations in ridge-crest research. A component of the Ridge 2000 program will be the creation of a data management system that will catalog multiple levels of metadata with user-friendly, Web-based tools for searching and accessing data. These tools include complex searches, relational databases and effective visual display of all types of data. The greatest advances in our understanding of the ocean basins will come from cross-disciplinary investigations that are facilitated by the merging of different data types. The vent fish Bythites hollisi emerges from a high-temperature vent region known as Hole-to-Hell, at 9 degrees 50 minutes north latitude along the East Pacific Rise. 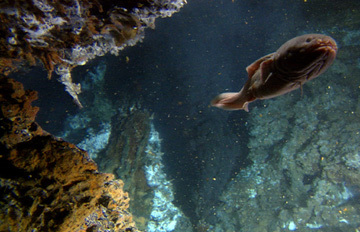 The species is common at various vent fields along the Galapagos Rift and East Pacific Rise. A black smoker vents in the background. Ridge 2000 encourages the openness and sharing of data for the mutual benefit of the scientific community. For Ridge 2000 to succeed as a community program, all potential investigators must have ready access to data from the Integrated Study sites to compete equally with previous investigators at a given site. The program is committed to facilitating equitable access to all data that can be used to develop hypotheses and research proposals. To this end, the Ridge 2000 community has adopted a data policy. In accepting NSF support within the Ridge 2000 program, each principal investigator is obliged to meet the data policy requirements as an integral aspect of their participation in the program. Rapid dissemination of metadata and data will maximize technology transfer across the program and encourage scientific integration, coordination of research and the construction and testing of hypotheses. Given that the program anticipates funding for the next 10 to 12 years, the rapid sharing of all data collected is central to its success. Hassler is the Ridge 2000 program coordinator (e-mail her at dhassler@psu.edu); Goehring is the Ridge 2000 education and outreach coordinator (e-mail her at exg15@psu.edu); and Fisher is a professor of biology (e-mail him at cfisher@psu.edu). All are at Pennsylvania State University. Visit the Ridge 2000 Program online.